SppDb comes complete with a sample data file containing information on a number of species. It is a good idea to experiment with it before using SppDb to add your own data. If you start with the sample, you can always add your records and delete those you do not want as you go. 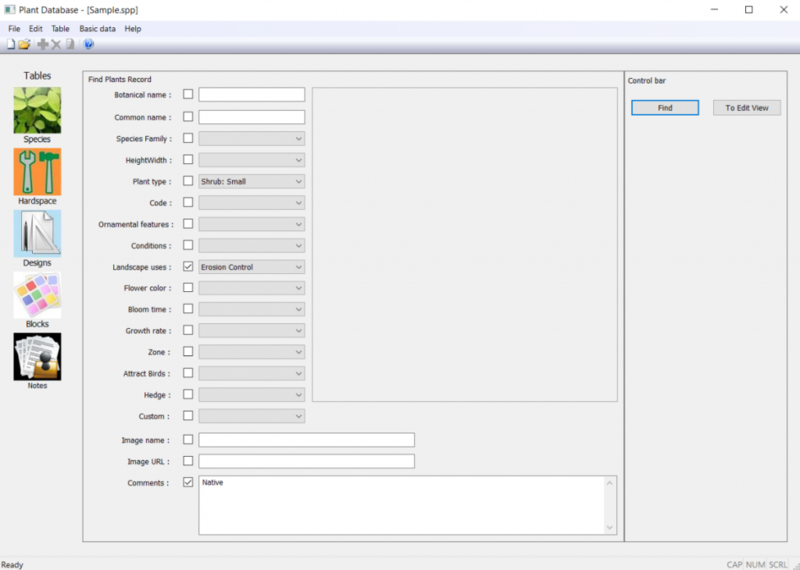 Use File > Open and select the sample database. 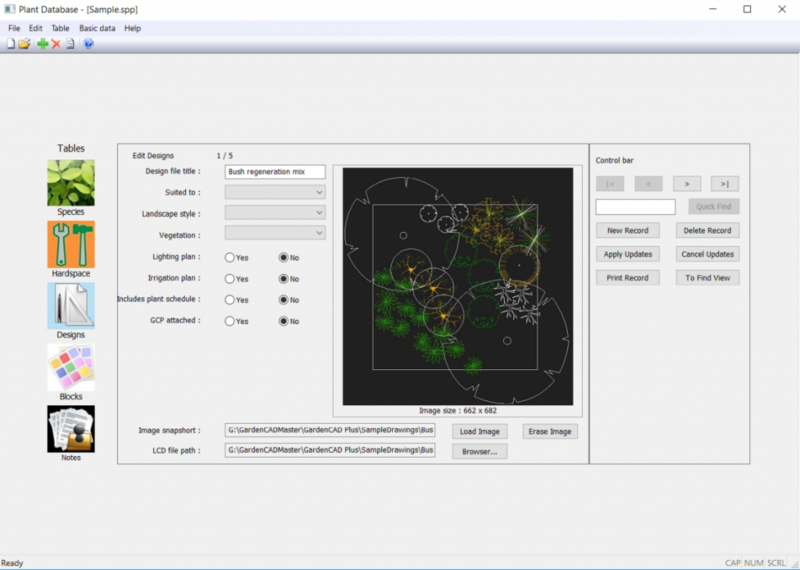 Click on the icon to play a movie that introduces SppDb by examining the sample plant data file supplied with SppDb. The image below shows one of the last entries in the database file. Here is a small movie that shows how to edit the sample database, add a new species and filter a list. Click on the icon to play a movie showing in some detail how SppDb works. This is a comprehensive movie and takes some time to download (please be patient). A more abbreviated ‘quick look’ movie can be found on the Home page. When SppDb is started, a splash screen shows briefly. 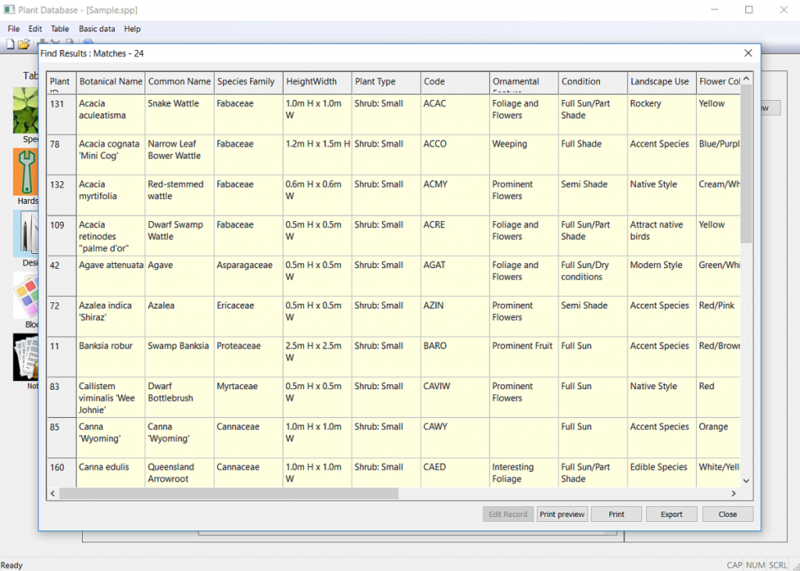 This is followed by the Plant Database view shown below. 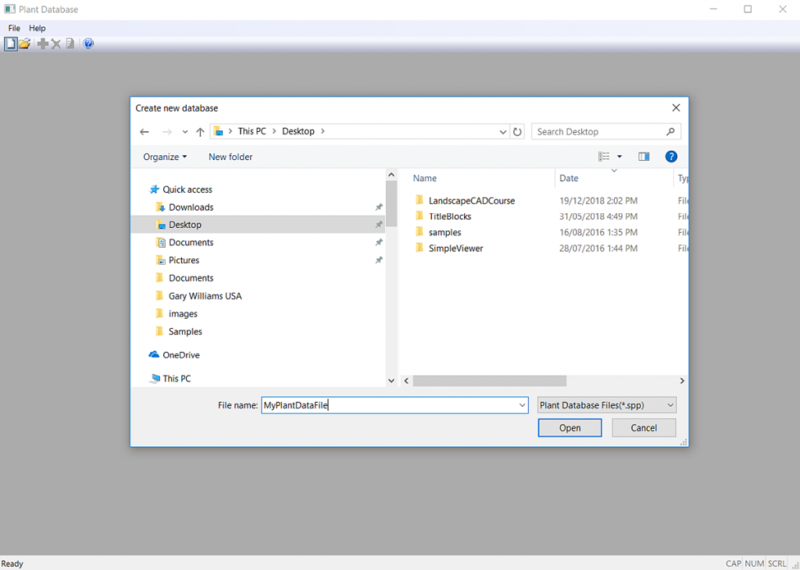 At this point, you could create a new database file and begin to add your own information, but we suggest that you open one of our sample files. 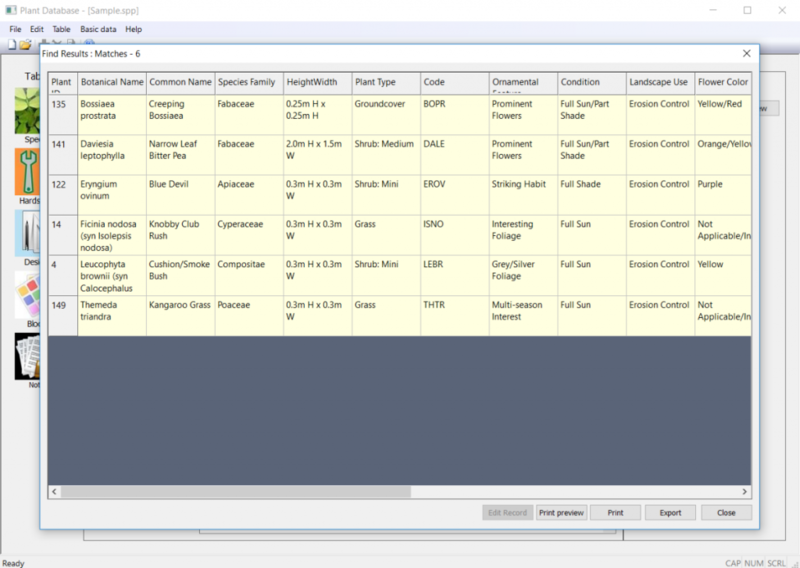 This sample data set will give you a chance to see what the software can do without the need to add data of your own. Click File>Open and select the file Sample.spp. Tip: You may need to navigate to your My Documents and SppDb folder to find the Sample file. 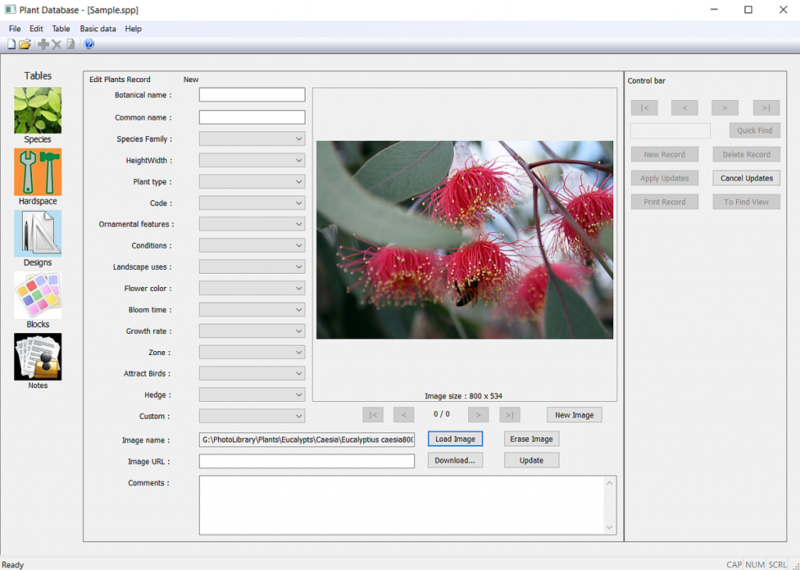 After selecting the sample set, an ‘Edit Plants Record’ screen similar to that shown below will appear. 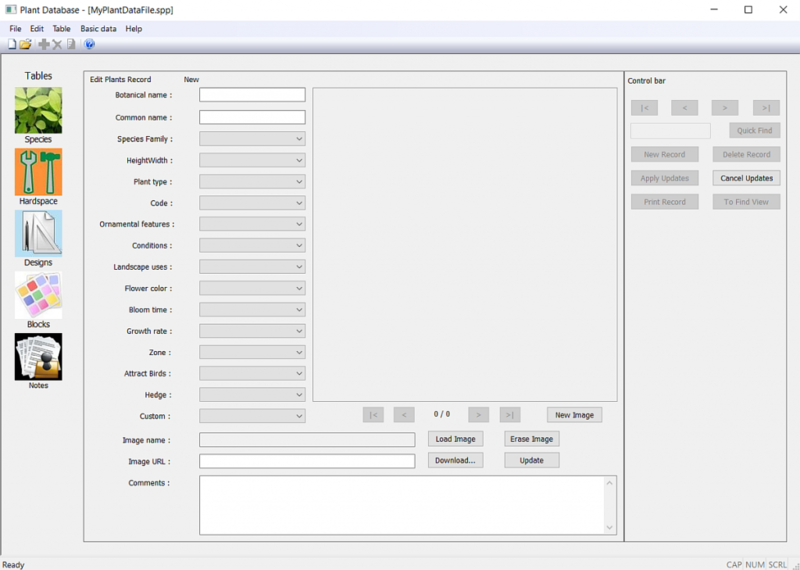 This is the screen to use for creating new entries (records) and making changes to existing entries. You may not see a plant image. Provided that your computer is connected to the internet, just clicking on the download URL image button will download an image from our web site and populate the database. Note that the database is in alphabetical order of species name. Use the data controls in the Control bar at the bottom of the window to scroll through the plant file. [The information about each plant is referred to as a record]. The >| control can be used to move to the last entry and the |< moves to the first entry. Finding plants that meet certain criteria is simple. Click on the ‘To Find View’ button at the right of screen. 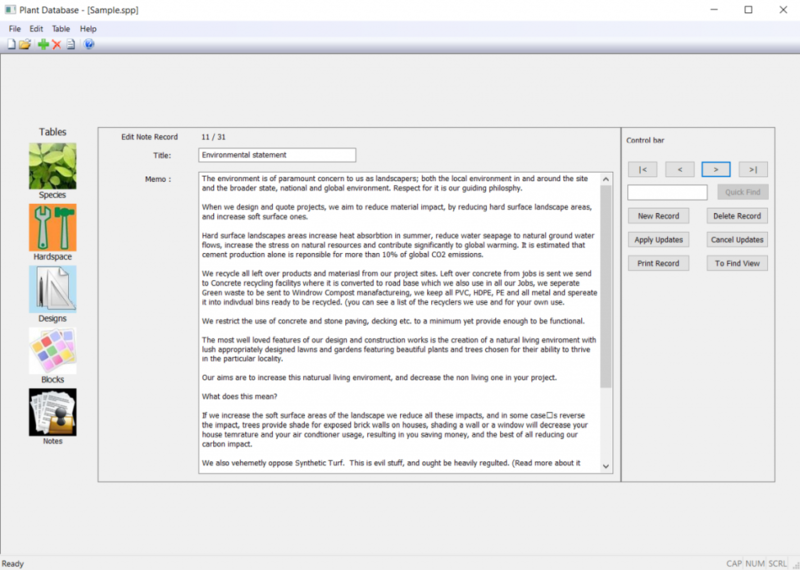 A ‘clean’ version of the plant descriptor form will show. Simply click the tick box to the left of the category you wish to search for and select the desired criteria from the drop down list. It is also possible to find plants of a particular name – typing ‘Ac’ in the botanical name field will find all the Acacias in the database. Click the find button and a list of plants that fit the chosen criteria is seen on the screen as shown below. 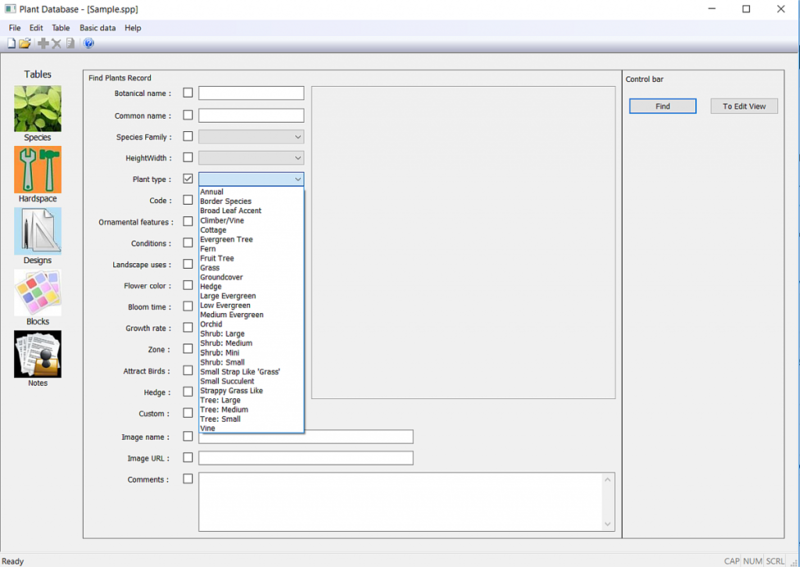 To produce a printed list consisting of just the botanical name, common name and size, select the Print button. The Close button returns to the Edit Plant record view. the Preview option puts the list on the screen. The image below shows an example where we are ready to search for those species that are suitable for erosion control in dunes and that are also native species. 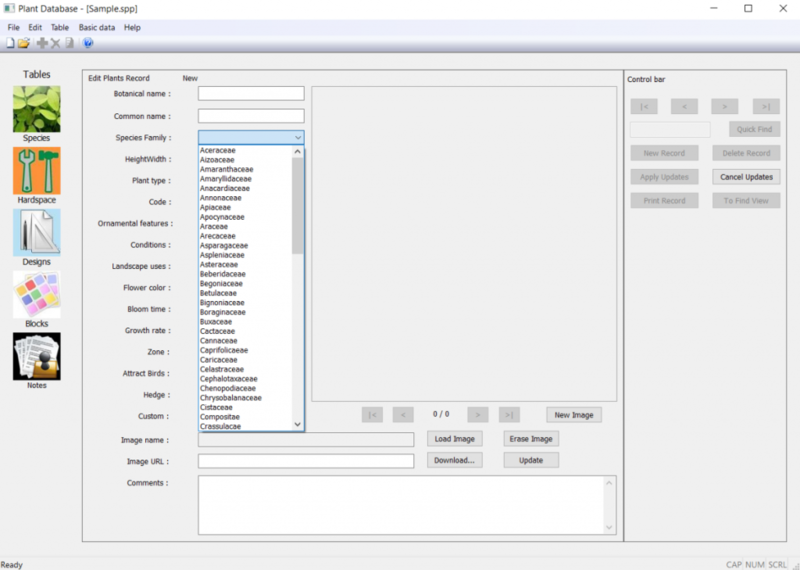 Click on the Find button and the list of species that meet those criteria will be generated. Print or Print Preview to view the list. The image below shows a PDF version of the list using these criteria. Note: This sample database has the image files included in it (by downloading the images from the SppDb web site). Scrolling through records may not be as rapid as you would like. However, when you create your own database, the images are stored as links rather than embedded images, so the file size of the database is dramatically reduced and the scroll speed is rapid. 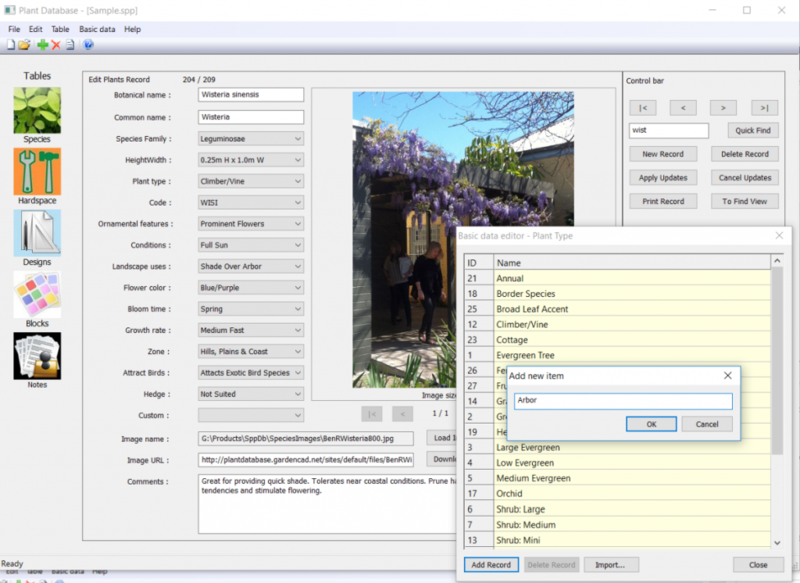 We do however recommend that you use your favorite image editor (we like the free IrfanView editor) and reduce the file size of each image that you load to a maximum of 800 pixels wide. Experience tells us that this image size prints at good resolution on most size sheets. New records (plants) are added via the Edit Plants Records view. 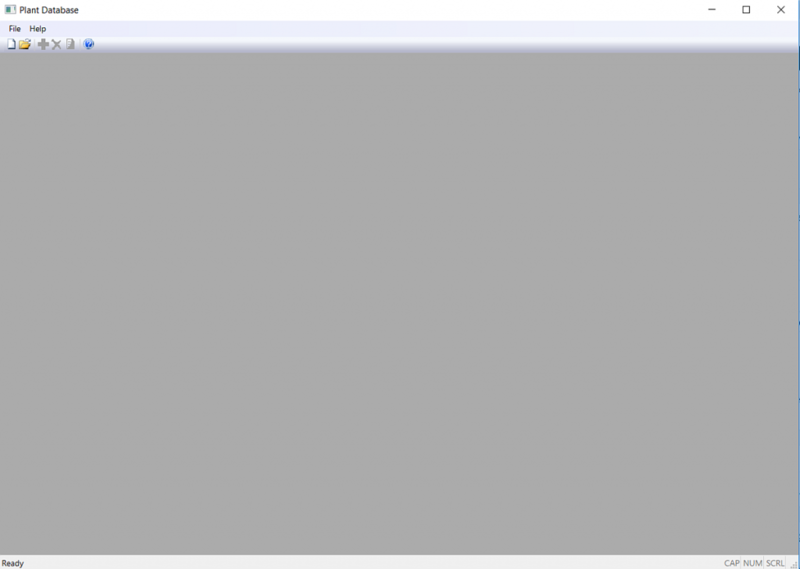 Click New Record and a blank screen shows. Type the botanical name and common name of the species that you are adding and categorize its uses by selecting an option in the appropriate boxes (fields) as shown below. When it comes to adding the image, click the Load Image button (circled in the figure above). 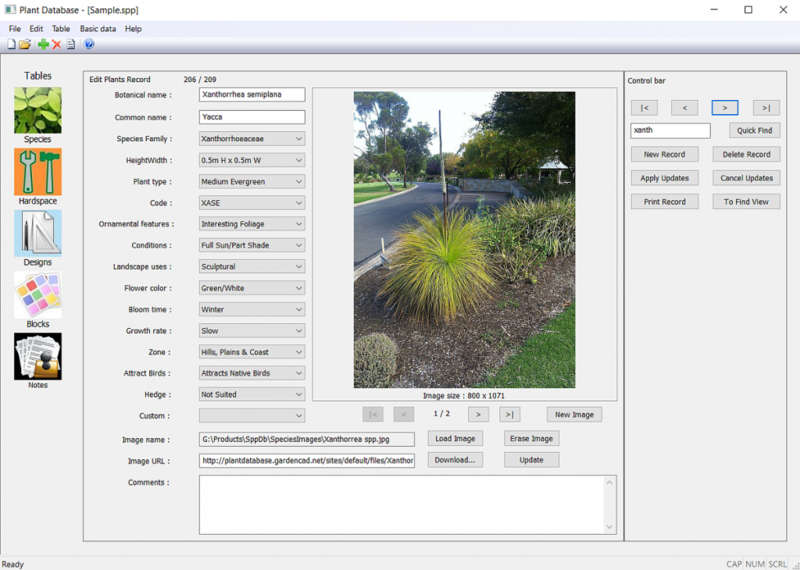 Insert a URL from the Internet or navigate to the location in your computer system where the photo of the plant that you have taken resides. 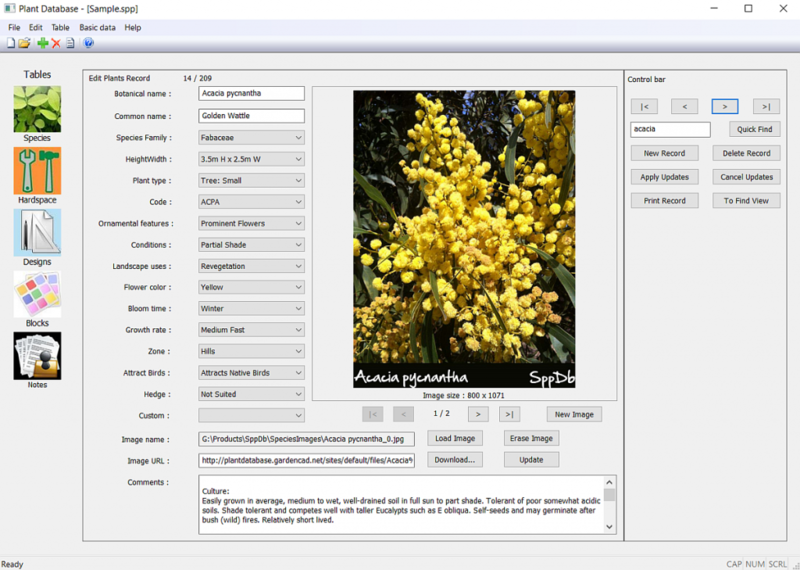 Here we are adding an image for Eucalyptus caesia from a folder called photolibrary on our server (G: drive). The location of your image files will of course be different. 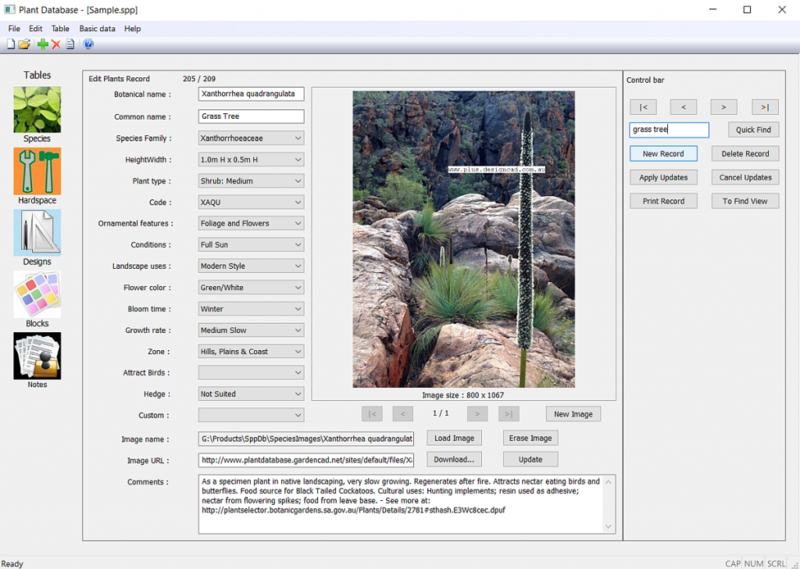 You will find it much easier to work with SppDb if you edit the photos that you take with a tool such as IrfanView, adjust the size of the image to a maximum of 800 pixels name the resultant image file the same as the species and generic name of the plant species. Click the Apply Updates button after adding your description in the comments field. The new record is now in the database. The descriptors about the basic characteristics of plants in your collection are completely flexible. The image below shows us adding some information about the Star Jasmine. 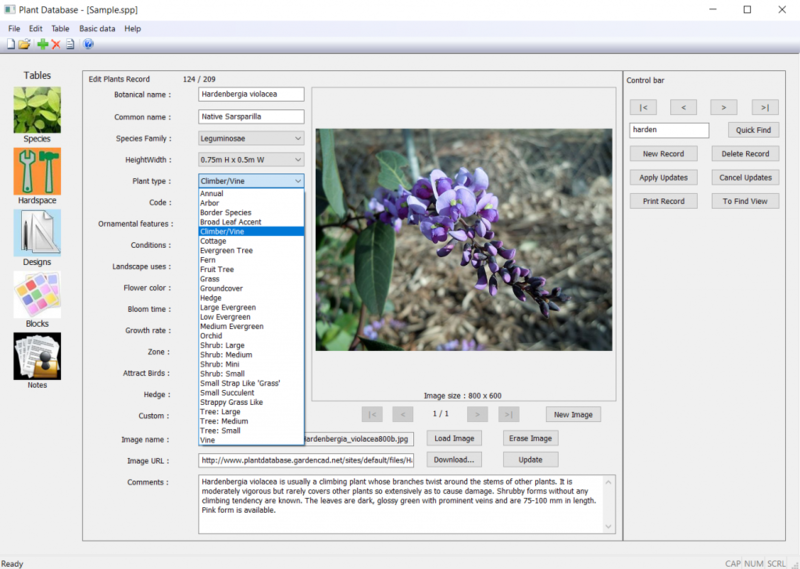 The first field in the list (Plant Type) show the descriptor Vine. Our preferred descriptor is “Climber”. So we assign Vine and then head to the Basic data drop down menu and edit the filed Vine, changing it to Climber. All entries in the database previously categorized as vines now become climbers. The image below shows Wisteria. We have categorized the species as far as the landscape Uses field, but do not have a suitable term for the plant. Our preference would be arbor plant, so we add it to the category in a similar way to the previous edit. Tip: Please make sure that you click the “Apply Updates” button after editing. In this way, you can add considerable flexibility to the database and tune it to the terms that you use. Here is another example where we added the term “Water Wise” – a term that might be used in searching for plants that will survive on the natural rainfall of the site. 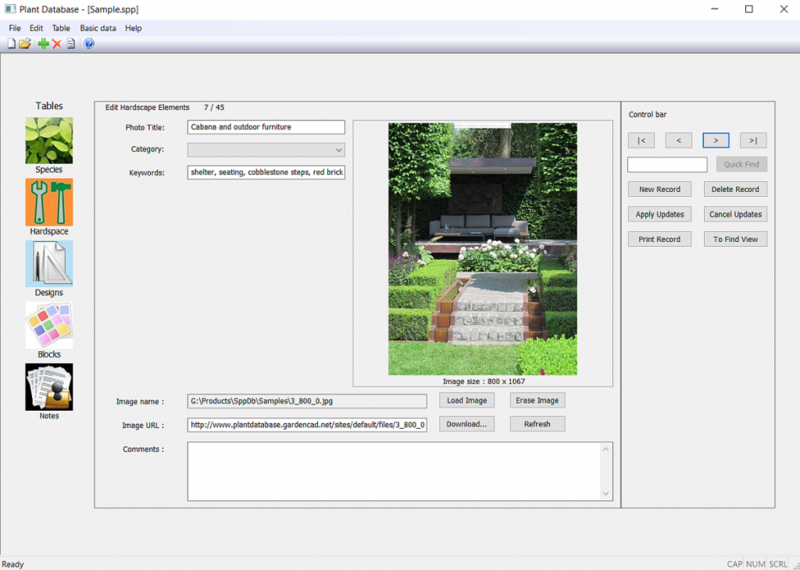 Images of other elements important in landscape design can also be stored using a separate table. Select the Hardscape button. This database works in exactly the same way as the plants database. You may wish to keep records of previous designs developed in your CAD application. A separate table is used for that purpose. A job can have several characteristics associate with it. Searching, printing, copying path operate in the same way as they do with plants. We also provide a table to hold information about CAD symbols you develop (symbols that differ from those delivered with your CAD software). Again, the method of interacting with the table is the same as that for plants. We also provide a table to hold text notes that you may wish to add to landscape design work. Start the MTEXT command in your CAD software, switch to SppDb, select the notes icon, search for an appropriate note, copy and switch back to your landscape software. Paste into the MTEXT editor. 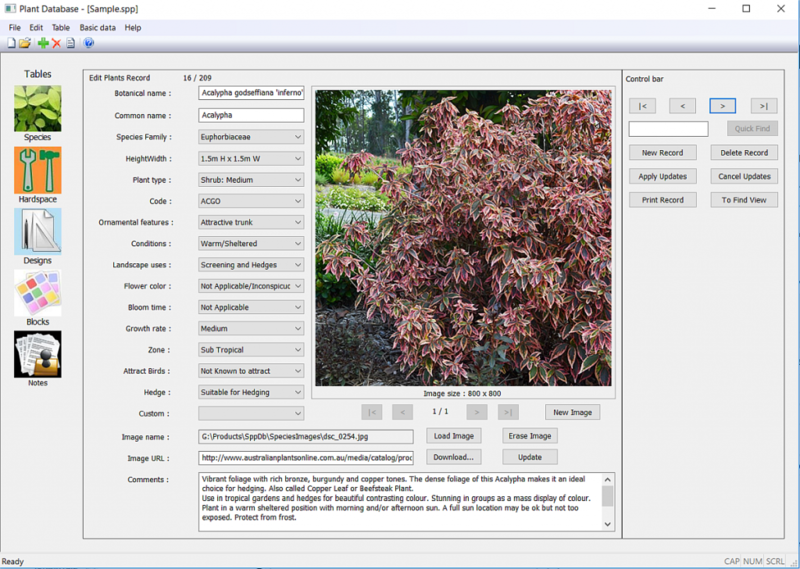 You will want to create your own plant data file. If you have a data file open, close it via the File drop down menu and then select New as shown below. 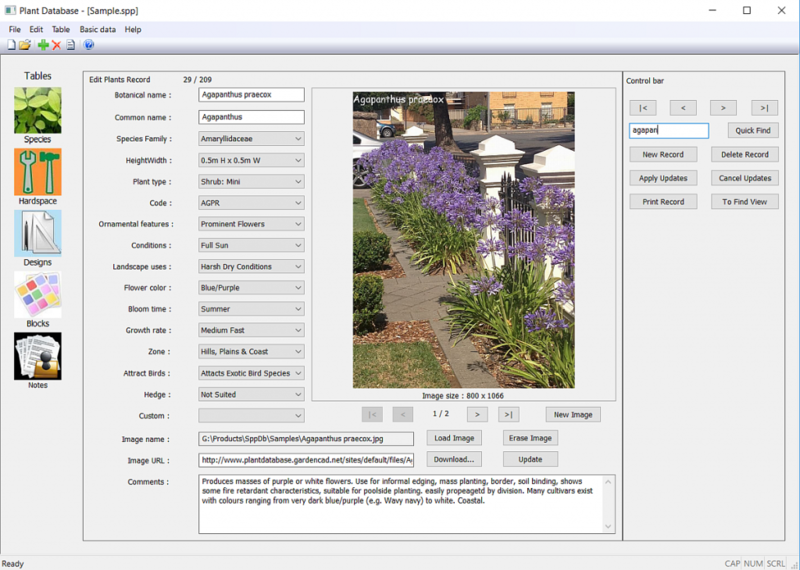 Here we have named the file “MyPlantDataFile”, but a better name would be the name of your landscape design practice. The first screen (record) you see is of course blank. Not only is the species record empty, but all other table entries and the Basic Data entries are also empty. Rather than create an entirely new database, you may prefer to start with a database we have called OneRecord. Here a considerable number of entries such as species family name etc. have already been made in the Basic Data information. Data entry can be made in a number of ways. If you know the botanical name of the plant species, type it in. then work your way down the list of fields. It is ok to leave a field blank. The categories you see associated with a file are under your control. 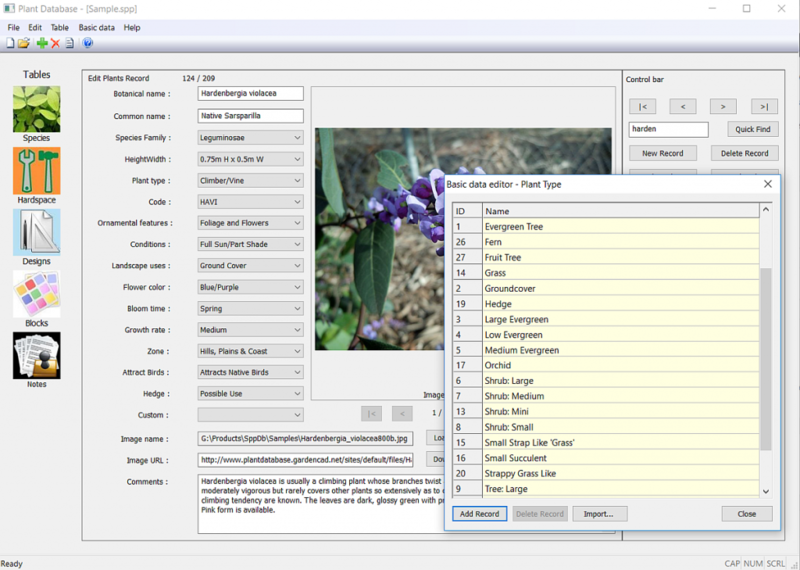 The figure below shows the drop down list of categories in the Plant Type field. 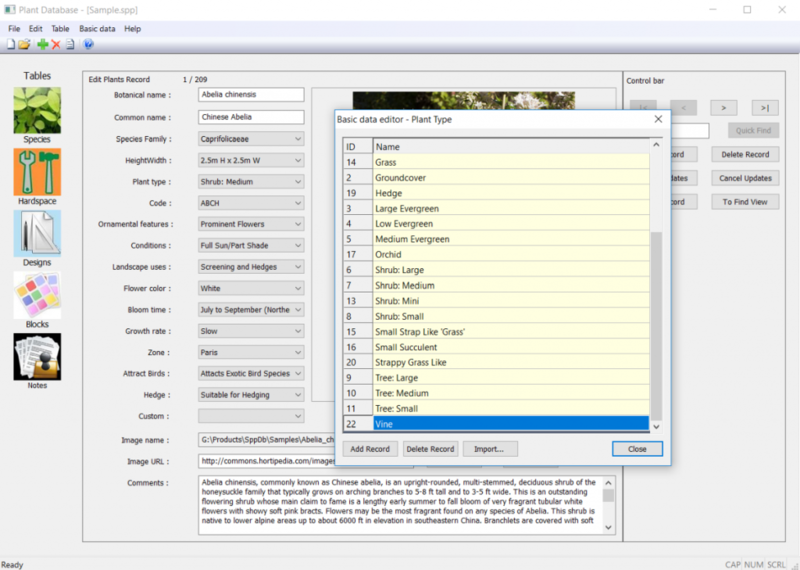 Clicking on the Basic Data drop down menu and then on plant type bring up a list of categories for this plant type field as shown below. 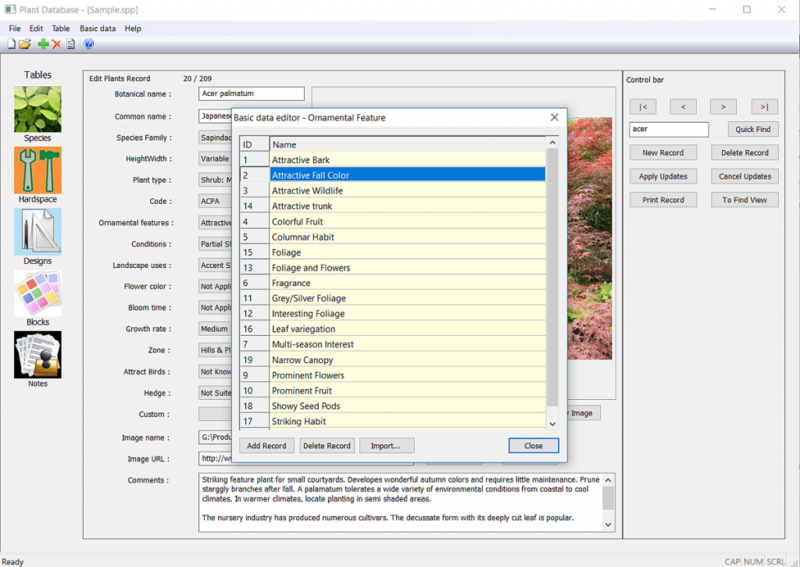 This basic plant type editor gives you the opportunity to rename options or create new ones. Our aim is not to force terms that you are not comfortable with. Some users in the Northern Hemisphere prefer to separate species into deciduous and evergreen and have several height categories for each. Remember, the whole aim of SppDb is for the software to work the way you work using terms you understand. 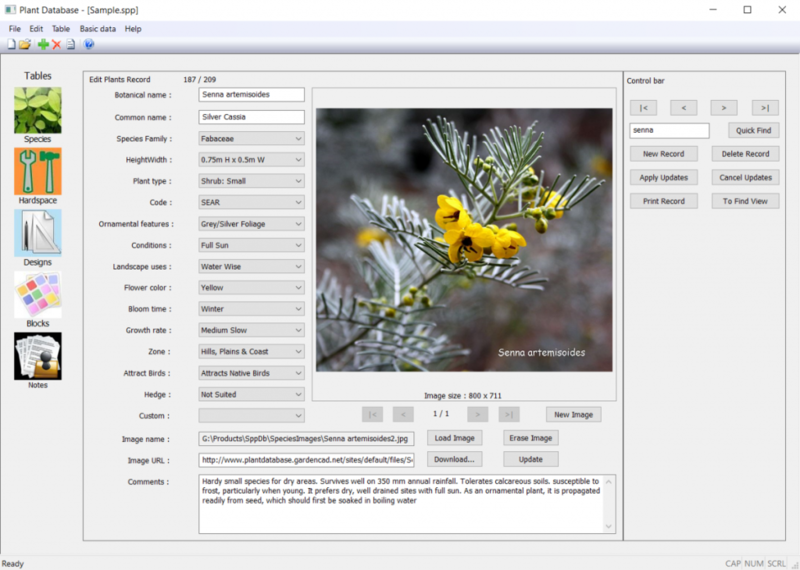 When it comes to the image you want to store for the species, click “Load Image” and browse to the location on your computer where the image is stored. We store ours on a server drive (G:) and in a folder called photolibrary, a sub folder called plants and finally further sub folder named the same as the plant species. Once selected, the image will be loaded. SppDb copes with images in either landscape or portrait mode. 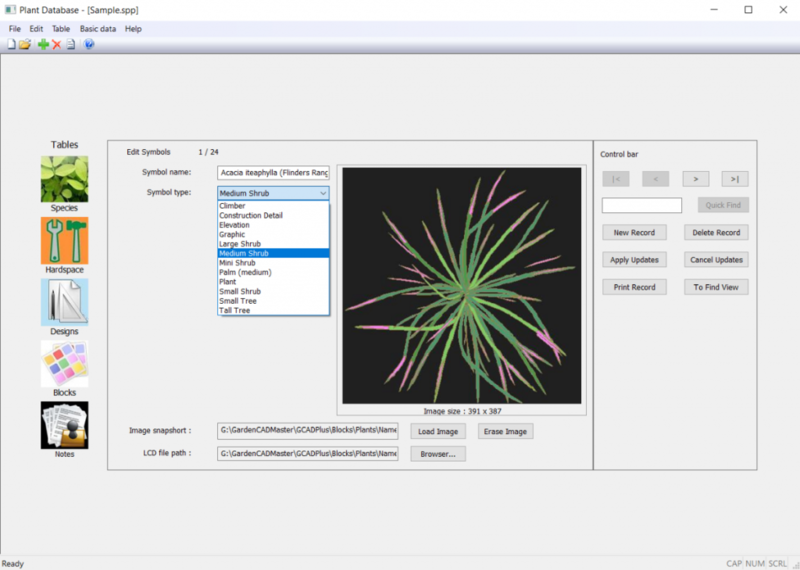 The image below shows the result of adding Agapanthus praecox to an SppDb database. You can store images from the Internet (and you might choose to do that if you have permission to use those images in your professional work), but we like to store our own photos (edited to a size appropriate for CAD drafting) in the data file. The categories in other fields can be adjusted in a similar fashion. The figure below shows us in the process of changing a description in the ornamental features field from Attractive Fall colour to Autumn Leaves. Both mean the same thing, but we prefer the latter description. A quick find option at the right of the screen enables you to move to a particular record quickly. here we search for a Grass Tree. In this case the search for a common name is more convenient than typing the botanical name Xanthorrhea australis. This ‘trick’ makes finding plant records and editing much easier than scrolling through the alphabetical list as the database grows in size. It is possible to customize the options in various categories to suit your way of working. This extends to the use of other languages. Click on the icon to play a movie showing how we create a new plant list for the suburban areas of Paris.